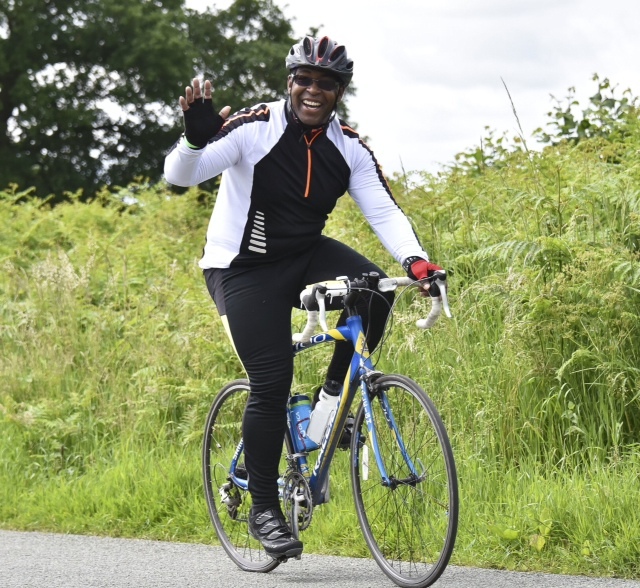 When Wolverhampton resident Joe Deans heard from his colleague Sarah Padfield how the acquisition of a specially designed Trike had changed the life of her disabled son James and the whole family, he decided to use his own cycling skills to help support Sarah’s Appeal to raise money for another child. James, pictured below, is now able to travel with the rest of the family under his own power and using the Trike has increased his confidence and development in so many ways. James guarding his Trike at a promotion with Baroness Rachael Heyhoe Flint who is the Patron of POWER PLEAS. 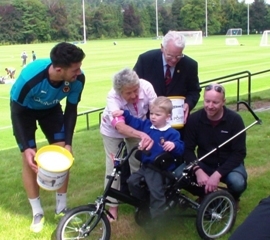 James’ Dad David, Alan Russell from Tettenhall Rotary Club and Wolves Captain Danny Batth. 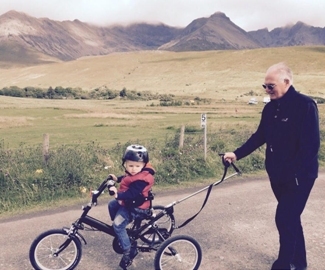 James Padfield on his POWER PLEAS Trike, taking his grandad for a walk. The bike ride is the Isle of Man ‘End to End’ on Saturday, 11th September: a 40+ mile off road mountain biking challenge.